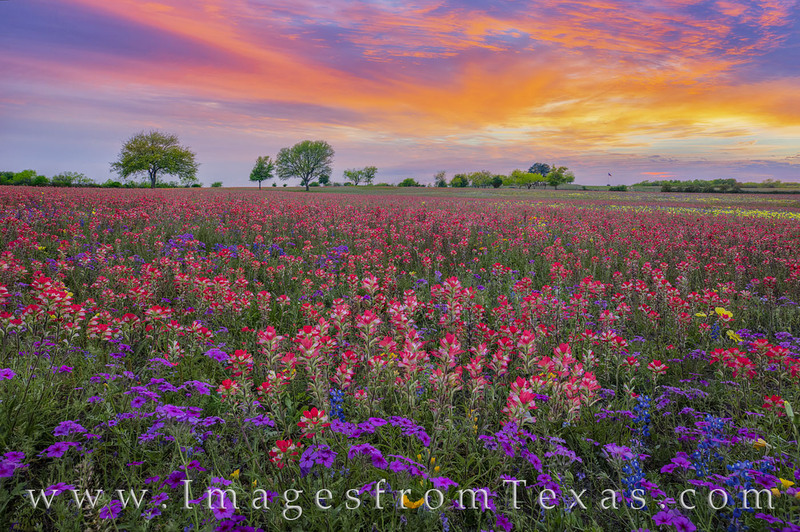 With a few purple phlox in the foreground, a sea of Indian Paintbrush stretches to the horizon in this wildflower photograph taken at sunset. The colors were amazing. If I had moved 20 feet to the left or right, a different wildflower would have colored the field - gold, orange, or blue - as seen in the companion images to this photograph. The sky’s amazing color only lasted a few minutes, and quickly faded to night. But the landscape was beautful while the color lasted. This image was taken in New Berlin, Texas, with permission from the land owner. Photo © copyright by Rob Greebon.